The Body Shop Tea Tree Pore Minimiser Primer – First Impressions.. I can almost guarantee that you’ve seen The Body Shop Tea Tree Pore Minimiser Primer all over Twitter, YouTube and Instagram. I’m very late to jump on ‘The Body Shop’ hype, having never used any of their products before other than a few samples sent to me by the gorgeous Alice, but I just couldn’t help myself any longer, and I had to pick up this product. I’ve always dreamt of finding the perfect primer – I’ve tried some other drugstore primers in the past, but have never found one that mattified my makeup in any way or prolonged the wear at all, often increasing the amount of oil on my skin instead – but until now, I hadn’t found my ‘Holy Grail’. SophDoesNails, who inspires a lot of my makeup purchases anyway, recently started testing this primer out in her videos herself. The Body Shop nearly always have a fabulous discount on, so when I found a code for 30% off, I knew I had to take a detour via our local store and invest. If you’ve read my post about skincare, you’ll know that I’ve been making more of an effort to ensure my skin is at it’s best recently and thought a primer in my makeup routine could only help with that. Tea Tree is an ingredient that I’ve had bad experiences with in the past, which meant I was a little dubious about the product to begin with, but I’ve been loving Lush’s Tea Tree Toner so I thought I would risk it. This is definitely going to sound a little odd, even having read it back myself, but hear me out – the first thing I noticed about the primer was the smell. Lush’s Tea Tree Toner has a very subtle, almost light enough to ignore it entirely, smell of Tea Tree. The primer itself smells very strongly, unsurprisingly, of it instead. This wouldn’t have surprised me in a cleanser or toner, but the thought of my face smelling like Tea Tree all day didn’t appeal to me in any way. Fortunately, the smell disappears relatively quickly, which I was glad about because I didn’t want to walk around all day smelling like a teenage spot treatment. In a similar way, the primer has an orangey-yellow tint to it, but this doesn’t affect the colour of your makeup and it actually blends out to be transparent. Anyone that’s read any beauty posts by me before will know that I have super oily skin (at least, most of the time anyway) with a jawline that’s prone to break outs, hence why I opted for a primer that was suitable for blemished skin and mattifies as well. After applying the primer, I could instantly see that my pores were less noticeable, especially across my nose and cheeks, which gave me a really nice base to apply my foundation over. I was a little unsure where to apply the primer – whether I should prime my whole face or only apply it to my nose and forehead which are the oiliest areas of my face, and was also mentioned in some of the reviews on The Body Shop website – but I have opted to apply it all over my face every time I’ve worn it so far, because while my nose and forehead are the most oily areas, my entire face is a swimming pool of oiliness in general. I tried to wear my makeup for as long as possible on the first few days of testing this out, and did find that even after twelve hours of wear, my makeup still looked pretty banging. Admittedly, I was still oily – I won’t pretend that it completely kept all of my oils at bay, because although that is the dream, it would also be a lie – but I was significantly less oily than I would be after twelve hours of wear without it. I tend to find that when my face gets oily, my makeup runs and I lose most, if not all of my coverage, but with this, I found that my nose, which as always was the oiliest area of my entire face, was shiny but still had a decent level of coverage, so I was impressed. I rarely touch up my face throughout the day, because I’ve always found that re-powdering causes my base makeup to separate, slide and simply, look bloody awful. I decided, in order to properly test the primer, I had to risk it and re-powdered my face after around ten hours of wear, safe in the knowledge no one else was going to see it if it did look bad. Scared to look in the mirror after, I was actually really surprised. My face was matte again, with a decent level of coverage, and it hadn’t separated at all, unlike every other primer powder combination I’ve tried. To say I was shook is an understatement, because I had never re-powdered my face before without wanting to take all of my makeup off straight away. If you couldn’t tell by now, I was super impressed. Overall, my first impressions of this primer have been pretty great, and I’m looking forward to seeing how it works with different foundations, if it’s still as amazing during the warmer months when I’m a super sweaty gal still after that full coverage look, and I’m also very tempted to pick up some other products from the Tea Tree Range to test. 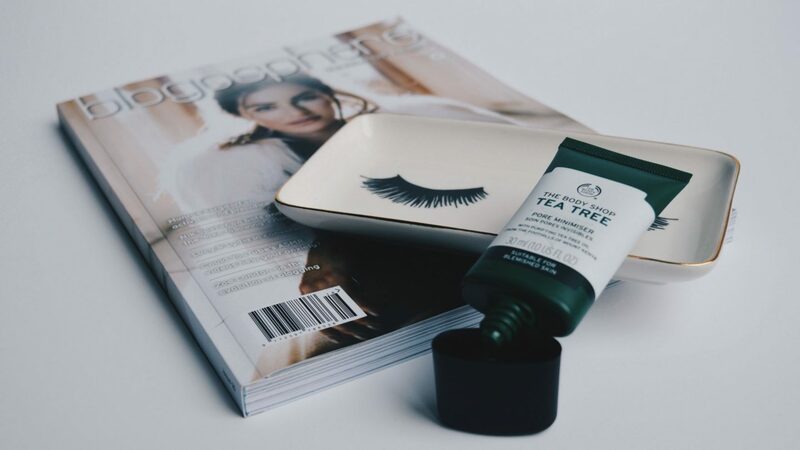 I can honestly say that this is one of the first beauty products that has been successful for me from the get-go..
Have you tried anything from The Body Shop Tea Tree range, and if so, what would you recommend? Do you have a primer that you consider your ‘Holy Grail’? "Five Guys You’re Bound To Find On Tinder.."
"Obsession Makeup – The Affordable Drugstore Brand You Need To Try.."